Orange juice deserves another chance behind the bar because, despite any Screwdriver-addled memories, orange juice (fresh orange juice) is an incredible cocktail ingredient. For many people, a Screwdriver was the first cocktail they ever had. But this simple mixture was probably made with sub-par orange juice and vodka that came in a giant plastic bottle, so it's likely that the drink didn't make a great impression. But orange juice deserves another chance behind the bar because, despite any Screwdriver-addled memories, orange juice (fresh orange juice) is an incredible cocktail ingredient. Here, 11 delicious orange juice cocktails. This surprisingly tasty cocktail is an unlikely mix of three ingredients: fresh orange juice, amaretto and light beer. A fantastic dessert drink, this creamy cocktail is like a grown-up Orange Julius. This refreshing cocktail gets a triple hit of orange. There’s orange juice, orange-flower water and orange zest. Sweet-tart blood orange juice intensifies the margarita-ness of this cocktail. This is an orange-infused variation on the Commodore No. 2 (bourbon, crème de cacao, lemon juice and grenadine). 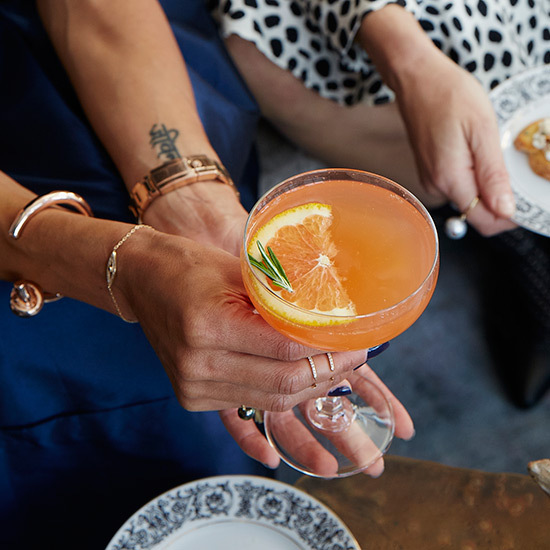 The perfect brunch drink, this cocktail is made with blood-orange juice, Aperol, rosemary simple syrup and spritzy Prosecco. A powerful mix of white rum, gin, brandy and sherry, this old-school tiki cocktail is tied together with orange juice and orgeat. With two Italian ingredients—Prosecco and the bright orange-red aperitivo Aperol—this cocktail is a nod to Mario Batali’s heritage. This drink is essentially a gin sour made with honey in place of sugar. The addition of orange juice makes it fruitier and less tart. Eric Ripert invented this complex, spicy-sweet rum drink on the spot in Puerto Rico.